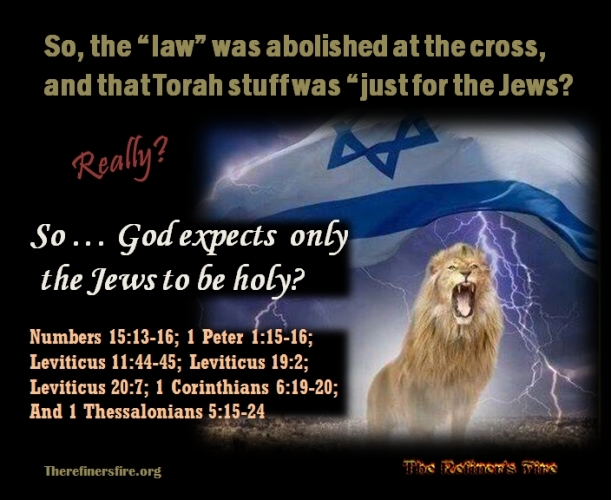 The Refiner's Fire Blog: Does God only expect the Jews to be holy? As we near the end of another year of Torah study, I feel the need to reiterate that YHWH meant for ALL to obey His Torah. Anyone who has ever read and actually studied the Torah (Genesis through Deuteronomy) can see that YHWH meant His Torah (Divine Instructions in Righteousness) to be for everyone who accepts Him as their ELOHIM. Yet there continue to be those who insist that Torah (which they erroneously refer to as "the Law”) was given only to “the Jews." Never mind, there were 12 tribes standing at Mount Sinai, as well as the myriad Gentiles who had followed Moshe (Moses) out of Egypt and were commanded to do exactly as YHWH’s people did (Numbers 15:13-16). So, what makes the Jews themselves and just about anyone else with any Bible knowledge believe that Torah was given only to “the Jews?” Did He mean for “only the Jews to be holy?” Heck no! It was simply because when YHWH dispersed the endlessly disobedient tribes into the nations, He chose the Tribe of Judah to take Torah into the world and safeguard and preserve it (Genesis 49:10, Micah 4:2)! Y'shua was born into the Tribe of Yehudah/Judah, but He never once taught that Torah was "only for the Jews!" Yes, the Jews (who have been safeguarding Torah for thousands of years) are expected to be the EXAMPLE of holiness, but, according to Numbers 15:13-16 where we see YHWH reiterating it four times in a row, ALL who accept Him are to do exactly as His people do! As an aside, nobody automatically “becomes a Jew” when they begin to be Torah observant. Only someone descended directly from the Tribe of Yehudah (or one who converts) can legally call themselves a Jew. However, they CAN refer to themselves as “Hebrew.” Why? Well, the answer lies in Genesis 12 when Avram accepted YHWH as his God, and began to obey His every command, he "crossed over" both spiritually and physically into the land YHWH commanded – and thus he became a HEBREW (which means “to cross over”). Avram, who later became, Abraham became a HEBREW, and all of his descendants became known as Hebrew. Therefore, all those who accept YHWH can legitimately refer to themselves as Hebrew. "Jesus freed us from Torah" and "We don't have to follow that anymore" are the most dangerous things I hear people say when they hear Torah mentioned. They pick and choose what they believe, condemning one form of behavior but accept others (homosexuality is sinful, but it's okay to eat pork, wear tattoos, celebrate man-made holidays, etc.). You're absolutely right, Kevin! Thanks for taking the time to post! I just heard someone (a Messianic Jew) reasoning it out like this; YHWH gave different instructions and law for different people to obey. The Comhanim had different rules to follow than those of the general population. The king had special rules only applying to him. The Jews had their own, and the Gentile converts their "lighter" rules than those of the Jews. This was how he claimed that the Gentiles no longer need to keep the whole Torah but only those that the Jerusalem council agreed upon. How blind to the simple instructions of the Torah can someone be... I pray that he can come to understand the Truth.